Whenever my attention is called to it, I am conscious of great satisfaction in the thought that I was permitted to write the hymn “I need thee every hour,” and that it was wafted out to the world on the wings of love and joy, rather than under the stress of a great personal sorrow, with which it has so often been associated in the minds of those who sing it. I remember well the morning, many years ago, when in the midst of the daily cares of my home, then in a distant city, I was so filled with the sense of nearness to the Master that, wondering how one could live without Him either in joy or pain, these words “I need thee every hour” were ushered into my mind, the thought at once taking full possession of me. Seating myself by the open window in the balmy air of the bright June day, I caught my pencil and the words were soon committed to paper, almost as they are being sung today. It was only by accident, it would seem, that they were set to music a few months after and sung for the first time at a Sunday School Convention held in one of the large western cities. From there they were taken farther west and sung by thousands of voices before the echo came back to me, thrilling my heart with surprise and gladness. For myself, the hymn was prophetic rather than expressive of my own experience at the time it was written, and I do not understand why it so touched the great throbbing heart of humanity. It was not until long years after, when the shadow fell over my way—the shadow of a great loss—that I understood something of the comforting in the words I had been permitted to write and give out to others in my hours of sweet security and peace. Now when I hear them sung, as I have sometimes, by hundreds of voices in chorus, I find it difficult to think they were ever, consciously, my own thought or penned by my own hand. A few years before writing the words to this hymn, she had established a songwriting connection with composer Robert Lowry (1826–1899), who had been pastor of Hanson Place Baptist Church in Brooklyn from 1861 to 1869, but left to take a professorship at his alma mater, the University of Lewisburg in Pennsylvania. Hawks apparently sent the lyrics to Lowry, and he composed a tune for it (usually called NEED). The song was included in a special collection of hymns prepared for National Baptist Sunday School Convention in Cincinnati, Ohio, November 20-22, 1872, at which William Doane was the music director and Robert Lowry was a guest speaker. This collection, New Sacred Songs, Prepared Expressly for the National Baptist S. S. Convention (Cincinnati, 1872), edited by William Doane, apparently does not survive in any known libraries or collections. We take the little folks—the toddlers—in the infant school; we take the young men and the maidens; we take the old men and the old women; we take them all; from the time they can begin to lisp or totter again—this time with gray upon their heads, their whole bodies’ weight upon a staff. Let them come in—all of them; come in—and if the little babe in arms, even, can understand the simple story of how Jesus came into the world to save sinners, even little sinners like that babe in arms, come in! Lift up the Sunday-school. Let there be a radical renovation of the whole system, and let it extend to the singing. … We have a class of hymns that no really intelligent person, who loves his intellectuality, would attempt to sing. More and more we must weed out that miserable stuff. I say to you here, in confidence, upon this platform, that, God sparing and helping me, whatever he permits me to do in that line, I will do for the Sunday-school hymnody. “I need thee every hour,” it seems, was an important contribution to that end. It was first published broadly in Royal Diadem for the Sunday School (NY: Biglow & Main, 1873 | Fig. 1), in five stanzas. Fig. 1. Royal Diadem for the Sunday School (NY: Biglow & Main, 1873). The hymn was soon after adopted into the evangelistic campaigns of gospel composer and compiler, Ira Sankey (1840–1908). According to his autobiography, he “sang it for the first time at Mr. Moody’s meetings in the East End of London. After that, we often used it in our prayer meetings.” It was included in the first edition of Sankey’s famed Gospel Hymns and Sacred Songs (1875 | PDF) in the U.S., and in the British series Later Songs & Solos (London: Morgan & Scott). Charles H. Gabriel, The Singers and Their Songs (Chicago: Rodeheaver, 1916), pp. 38-39. The event is mentioned in Henry Burrage, Baptist Hymn Writers and Their Hymns (1888), p. 477 (Archive.org); the collection, New Sacred Songs, is partially indexed at Hymnary.org (NSSP1872), but no surviving copy could be located by the present editor. 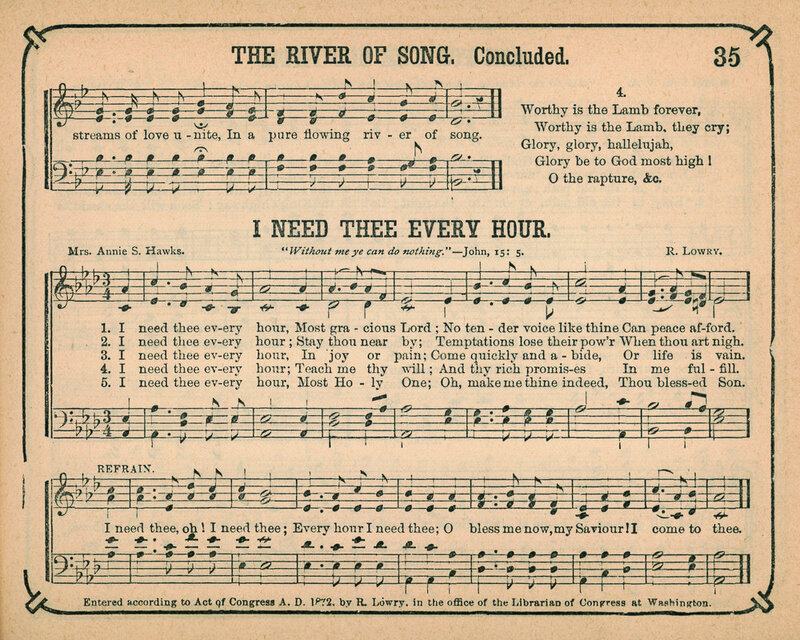 The minutes of the convention listed every song presented, but “I need thee” was not named as being performed (PDF). Papers, Discussions, and Resolutions of the Second National Baptist Sunday School Convention and Institute (Philadelphia: Bible & Publication Society, 1873), p. 48. Ira Sankey, “I need thee every hour,” My Life and the Story of the Gospel Hymns (NY: Harper & Brothers, 1906), pp. 165-166.